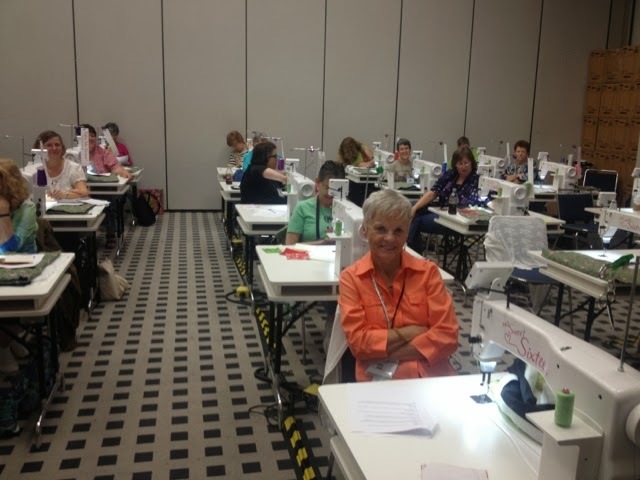 I taught another two Sweet Sixteen classes in Houston today. My students were amazing and talented and I was honored to spend the day with them. I got to spend a few minutes with the fabulous Pepper Cory. 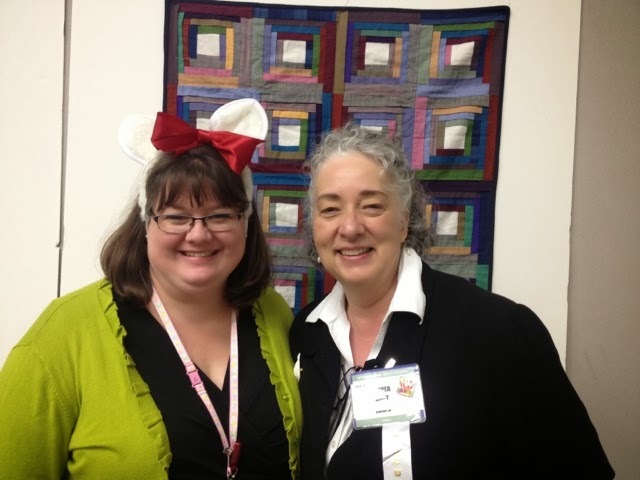 She and I shared a suite when we taught at Vermont Quilt Festival a few years ago. She has been a hero of mine ever since. A Facebook friend left a present for me today. Do you think she knows me well? A friend and student of mine (one person, two titles) gave me the sweetest Hello Kitty hand sanitizer kit today after class. She knows me well too! I had a great Halloween in Houston and can't wait to do it again tomorrow! What a great day! I had 25 eager students on 25 Sweet Sixteens and they ROCKED! When I teach at a show, I prepare kits for my students so that they don't have to bring anything but their lively selves. I Was so relieved that the boxes were waiting for me when I got here! The boxes are now out of the hotel and in the classroom, ready and waiting for tomorrow's classes. Dumb Debby move of the day: I never changed my watch to the correct time zone yesterday I was shockingly early for everything today but didn't realize it until noon! 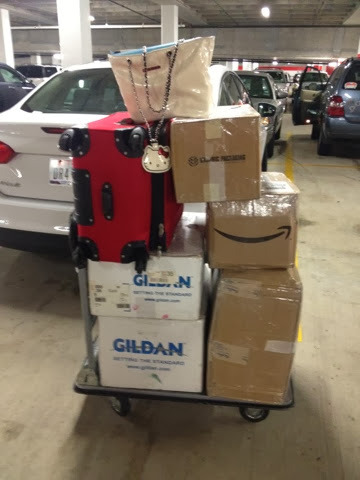 I am packed and ready for Houston! I have one suitcase of quilts, one suitcase of supplies, and a small carryon with a few changes of clothes. 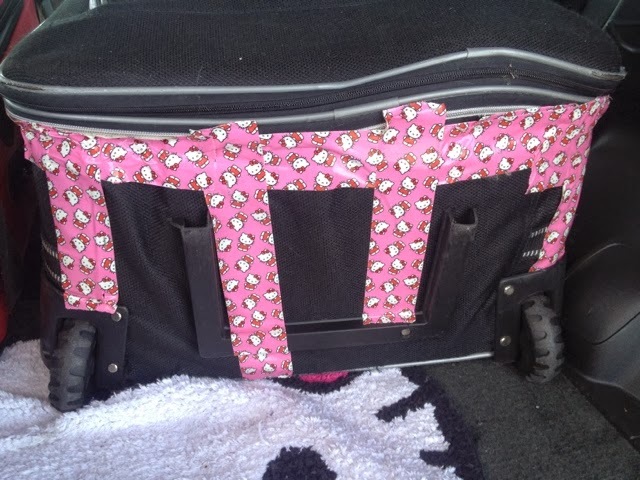 One of my suitcases is quite pathetic (thanks Delta baggage carriers) but I'm trusting Hello Kitty to hold things together for me. This probably goes without saying, but as a traveling quilt teacher, I travel a lot. I can recognize a hotel brand by the curtains, carpet, or the cookie served at check-in. I can recite airport codes easier than I can recall my bank passwords. I know where to eat at every major airport. I can live for a month out of a carry-on suitcase. I can pack that suitcase and be ready to leave in less than 10 minutes. I have been to 39 states and 3 foreign countries (so far). I meet the most delightful people and love most of the parts of this job. I'm away most weekends from March - May and September - Thanksgiving. Things slow down a bit in the summer and winter. This is the quilt show calendar and I accept it. One of the downsides is that I miss going to church. I love my church family and I miss them when I'm gone. I leave for Houston tomorrow (bah!) so I got to visit with my church family this morning. It was WONDERFUL! There were a lot of hugs and "See you after Thanksgiving"s. Today was even more special because I got to gift a quilt. She cried when I gave it to her. She cried when she called me after church to thank me again. "It's so special and it's MINE! It matches my chair in the family room perfectly! No one can touch it!" I convinced her to use it and throw it into the washer and dryer. Gifting quilts is always a selfish act on my part, because I get the biggest kick when I give a quilt away like this. If you've never tried it, I highly recommend it. I've given a quilt to a lady at the library, friends from church, medical receptionists... the possibilities are endless! Last week I ate a few Hello Kitty Cupcakes. It was MY PARTY and I'll eat cupcakes if I want to. The Hello Kitty Cupcake toppers were rings and I wore one of them to church this morning. A young lady (2 years old) spotted my ring and she now owns it. I would have given this to the first child who noticed it, but it was fun that the recipient is my son's wife's niece. I call myself her great-aunt, but others dispute my logic on this one. I hope you all had great Sundays, full of many gifts! This is my first look at my new DVDs. They were released today at Quilt Market in Houston. I am SO EXCITED!!! I arrive in Houston right as Quilt Market closes on Monday evening, but these will be at the Handi Quilter booth during Quilt Festival. I filmed in August in Salt Lake City. I have no idea what the final product looks like. Filming is such a weird experience. Behind the scenes, crazy things can happen. Some things work really, really well. Some things.... well, some things don't. Yes, I just chucked everything on the floor! The magic of television (DVDs, actually). I leave for Houston in 72 hours. Bah!!! 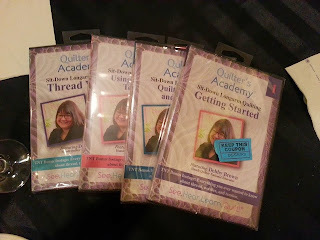 I am finishing up my class quilt kits (5 sold out classes require nearly 150 kits!!!) and made a run to the local batting factory for a few rolls. I am so grateful that I can pick up batting locally and not pay the ridiculously high shipping charges. I appreciate the savings and pass them along to my students. I know from experience that my car will hold 5 rolls of batting if I unbox them at the factory. Today I only needed 2 rolls so they fit easily. 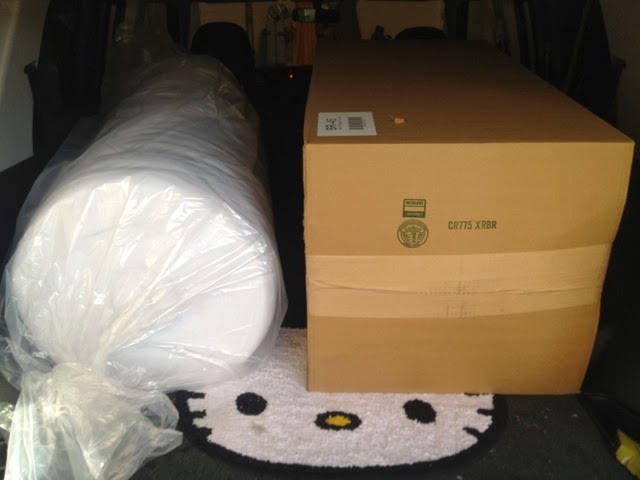 Yes, that is a Hello Kitty mat in the back of my car. My sister bought it for me, thinking I'd use it in my bathroom but I love seeing it every time I open my hatch! 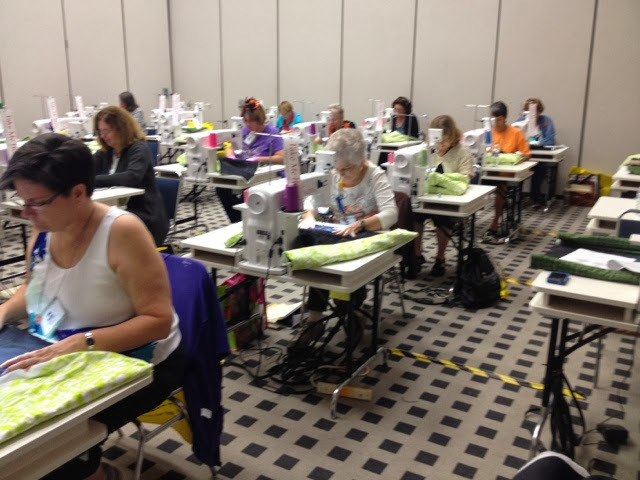 I am in my home office today, frantically preparing to teach at Houston Quilt Festival. I have so, so, so much to do but wanted to show some love to my neglected blog. It is not much of a surprise that I am a Hello Kitty fan. I don't consider myself over the top, but every once in a while I surprise myself. 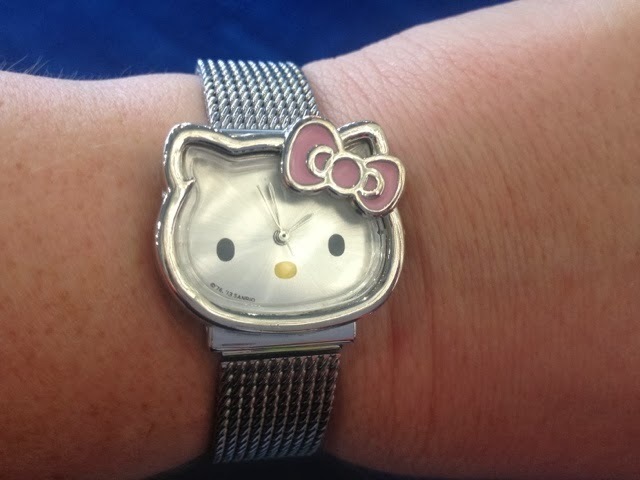 I plan to show my blog some love, and share some of my Hello Kitty collection. Most of it is in my purse, or in my office, or in my car.... OK, maybe I am a 'little' over the top. It is a USB extender. I have never noticed a lack of USB ports in my life, but she was So! Stinkin'! Cute! that I thought it best to be prepared for the looming dearth of USB ports. She hangs on the wall above my desk in my home office where she can be easily reached in case of emergency. Back to my Houston prep work! My quilt blog is exactly that -- a quilt blog. I have political opinions, and I don't write about them here. I have religious beliefs, and I don't write about them here. I have problems in my life, and I don't write about them here. My blog is about Quilts! and Hello Kitty! and Chocolate Cake! I have had conversations with folks who read my blog or my FaceBook page and they really think my life is all happy, all of the time. I am a very happy person and share my happy thoughts with you, but there is more to my life that I usually choose to keep private. 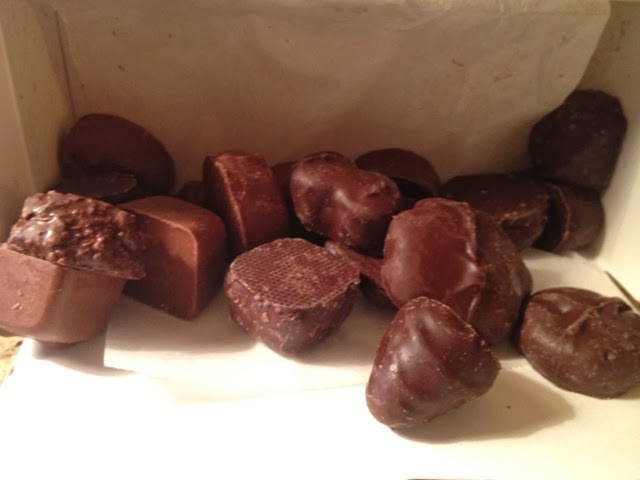 Today I am lowering the barrier between my happy blog and my real life. A month or so ago, I found a lump. I had a mammogram and ultrasound and these tests confirmed what I already knew. It has been a long month of waiting and additional tests and results and answers. I wondered, "How can I keep my mind off of this and keep on living?" I got that answer fairly quickly in the form of food poisoning that lasted 10 days, cost me 15 pounds and required medical intervention and heavy drugs. (This is another one of those things that I did not blog about.) Nothing consumes the mind more than violent food poisoning. Those were two weeks of my life that I will never get back, but I didn't have the ability to worry about my lump for two solid weeks. I have a few other medical issues (that I don't blog about) that would make surgery and treatment very difficult. No cancer diagnosis would be easy, and mine would be even tougher than most. This morning, I had another ultrasound. When the technician did my first ultrasound a month ago, I could see on her face the moment she located my lump. She became very serious and intent. Today, she started serious and intent and there was very little conversation. She did her job, told me to stay put, and left the room. She came back about 10 minutes later with a doctor who repeated the ultrasound. The doctor told me that there was no lump. She also told me that I must never have felt the lump in the first place (trust me, I did, and their own tests confirmed it) and that I was absolutely fine. That is the news I was hoping for. I thought that I would be overjoyed and elated, but in truth -- I was just relieved and exhausted. As I was driving home from the hospital, I realized that I needed to celebrate and as you know, I always choose to celebrate with chocolate cake. I was just going to buy a chocolate cake, but the bakery had these really cute Hello Kitty cupcakes so they followed me home, too. I have extra cake and Hello Kitty cupcakes to share. Will you celebrate with me? As you can see, my life is really all Happy! Hello Kitty! Chocolate Cake! so my regular blogging content will now resume. Quilts of Valor was mentioned on NBC news. 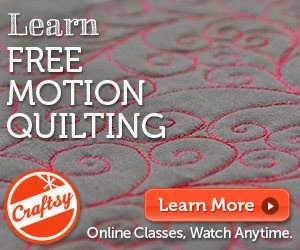 Watch the clip and then check out the Quilts of Valor website to see how you can help.